Not to be confused with the Champion Digimon, Digmon. 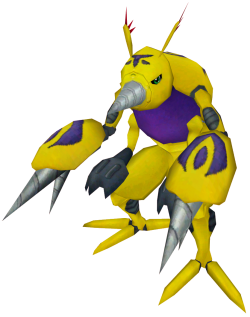 Digmon is an Insect Armor Digimon which evolved using the power of the "Digi-Egg of Knowledge". The Digi-Egg of Knowledge bears the attribute of "Earth", so those wearing this Digimental wield the power to manipulate the earth. Even though it uses the Digi-Egg of Knowledge, Digmon is known as "The Drill of Power." Digmon Armor Evolution only can be unlocked on Armadillomon (Shakkoumon (Jogress)) line. Digmon (Armor) was added to Korean Digimon Masters on May 14th, 2014. Digmon (Armor) was added as a Mercenary Digimon to gDMO with the September 23, 2014 Patch. Gold Rush Land attribute 4 seconds cooldown 76 DS consumed 4 skill points per upgrade Learned at Lv. Digmon rams its drills in the ground and generate a fissure. Big Crack Land attribute 8 seconds cooldown 114 DS consumed 3 skill points per upgrade Learned at Lv. Digmon fires its drills at the opponent. Duration: 3 second base + 1 second per skill increase (15 seconds max at 13/15). This page was last modified on 22 April 2019, at 20:09.